When I was in college I bought a lot of used stuff, not the least of which were books, CDs, and video tapes. There was just something about being entertained that appealed to me, and that still does today. Only today there are less used items around here because of innovations. For example, instead of used CDs I have a lot of digital music, and in place of video tapes there are DVDs (oh, and Netflix). Only books remain, and even then I’ve weeded out a lot of my used gems because of space constraints. Besides, my wife’s a librarian, so I can read those used books instead. But yeah, back in college I would find new “used” stores pretty much every week, on Fridays after I got paid from my on-campus job at the library. Sometimes I would go alone, and other times I would take friends along for the ride (the subway ride, of course), but I would always end up back home once the night was over with some amazing finds. Back in the mid-90s it was easy to locate pretty much anything used, and I guess Amazon.com’s Marketplace makes it easy to find them as well, even today. Just the other week I found the new CD from one of my favorite bands — Better Than Ezra — for only .75 cents. 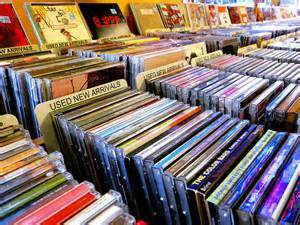 Yet, even though it’s still possible to find used items online nothing beat the fun of going into a little dingy shop, nodding to the tattooed cashier, and getting my hands dirty rifling through old CDs, old books, or old videos. There was just something about the experience that touched a place in my soul. I need those kinds of interactions with my purchases before I make them. I need the physicality of going to an actual place instead of just sifting through web links and clicking on “Buy Now.” Something… human is missing from the enterprise now, and even though I’m enjoying the Better than Ezra album, something is lost in the translation. Nothing beats the smell of an old book, or finding an old bookmark hidden away in its pages, or getting a CD cheaper because the case is cracked. I remember going into a record store that was going out of business and all of the albums were 50% off. It was like Christmas even though it was July. I even bought one of the posters off the wall because it too was on deep discount. There’s just nothing like it today. All those small shops are gone, and the interactions with others looking for their own diamonds in the rough are gone with them. When I go back to the streets and avenues that used to house them and see all the “For Sale” signs, or the different stores that have risen up that scream NEW NEW NEW I can’t help but feel sad. Because, contrary to what Barney Stinson said, new is not always better. I do so agree. Thanks for sharing your feelings and thoughts. It’s good to find someone who feels the same and talks about it. It’s amazing how devalued used items are these days but I have an amazing family that appreciates them just as much as I do. You should see us on Christmas morning. It’s a wonderful feeling.